The year was 1896 and the first experiential marketing activation was about to be conceived. It all started with a marketing savvy guy named William Crush. He was actually a passenger agent for a train company. 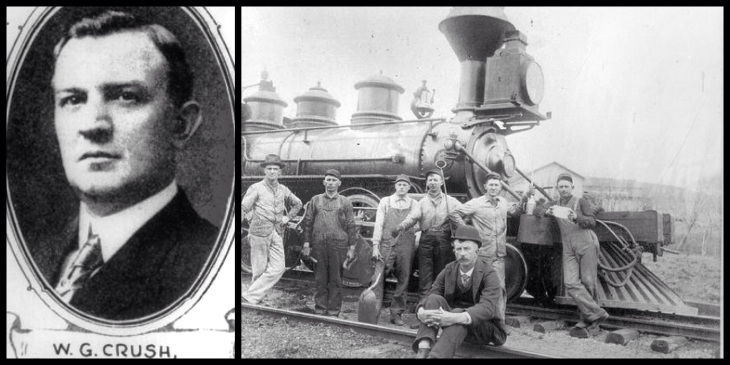 William worked for the Missouri-Kansas-Texas Railroad. Trains were kind of a big deal back then and they were upgrading to newer, better models. Unfortunately, it was also during an economic downturn so passenger ticket sales were on the steady decline. Crush wanted to help and started thinking about publicity stunts. He reasoned that if the stunt was big enough, the newspapers would cover it (yes, people read them in 1896). If they got enough publicity, it might spur people to buy more train tickets. And that might help him keep his job a little longer. So he came up with a crazy idea. A spectacle. A huge event. What did he do? He wanted to put two 35 ton locomotives on the same track and race them full-speed towards each other in front of a ton of innocent people. He took this concept to management where they immediately gave him the thumbs up. My guess is that approval came quickly in the days before 3 bidding, procurement, RFP’s or anyone questioning his the value of his ROI matrix (which was 6 btw). Anyway, with corporate approval, he took the locomotives on tour across Texas to drum up excitement and promote the big day. The event was to take place in a temporary pop-up town he called “Crush, Texas” (get it?). Actually it was an empty field just outside of Waco. To help drive attendees, train tickets were sold at a discount. Anyone in Texas could attend the event for a $2 round-trip ride (and presumably the opportunity to check out the all new passenger cars). To Crush’s credit, the newspapers from across the country picked up the story. Ticket demand skyrocketed. The train company deployed 33 trains throughout Texas to pick-up and return people to the event. Around 40,000+ people showed up in "Crush, Texas" that day. A party-like atmosphere included grandstands, pop-up restaurants, live bands and even a carnival. The two trains were on display, complete with sponsor advertising on the boxcars. And as promised, around 5pm the two trains slowly bumped noses like some sort of locomotive handshake. Then they backed up for a full mile each. The site was situated so onlookers could see the entire run of track. Crews were instructed to take the trains up to top speed, lock down the whistles and jump. Traveling at about 45 miles an hour each, 70 tons of steel collided in a high-speed explosion of shrapnel and fire right before the grandstands. Unfortunately, the engineers who promised the boilers wouldn’t explode were clearly wrong. Scrap metal flew up to a half mile. The grandstands were inside the danger zone. Many people were injured. A few even died. Crush was immediately fired. Word spread quickly and the story ran on the front page of newspapers worldwide. Public outcry led the train company to rehire Crush the next day where he continued to work until retiring many years later. Then famous ragtime composer Scott Joplin composed a song dedicated to memorialize the event in Crush, Texas. It became wildly popular. So there you have it. William Crush. A man before his time. A man who first set the bar for experiential marketing nearly 121 years ago. So much to learn from this man. He set the stage for modern day experiential marketing. But perhaps the most important learning here is simple: Always get your events on film. It’s the only way to prove WTF really happened. Check out the recap video below.